Aboriginal people of the Kukatha tribe were the first inhabitants of the Wudinna area. For the Kukatha people the numerous granite domes dotting the area ensured that there was always water available in granite pools and soaks at the base of rock formations that are common within the area. Robert Standley was the first European settler to the area and in 1861 he was granted a 10 square mile lease at the base of Mount Wudinna. 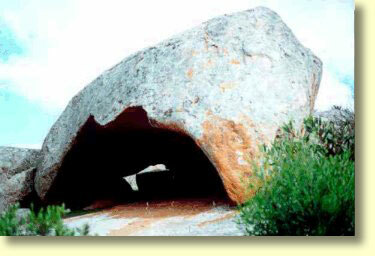 Early European settlement of the area was enabled by collecting and conserving water runoff from the numerous granite domes within the area. Water was conserved by construction stone water runoff channels around the base of granite domes. 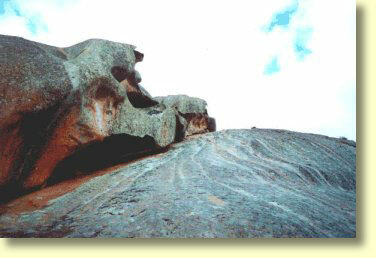 The granite structures in this area of Eyre Penuinsula are known to be a part of the Hiltaba suite of rocks within what is known as the Gawler Craton. The fertile soils that formed around the base of eroded granite soil also proved a boon to early settlers who relied upon wheat cropping and grazing acticities within the Wudinna district. Other major industries within the Wudinna area include granite mining and tourism within the nearby rugged Gawler Ranges. Today Wudinna is a friendly town of some 650 people. Wudinna also acts as a major service centre to the surrounding district. Wudinna is definitely well serviced from the point of view of the traveller. Located on the Eyre Highway at the northern end of Wudinna is a Tourist Information Bay that has a number of display boards describing the local history of the area, points of interest, the geology of the area and its associated granite landforms. Within the information bay is a barbecue site (operated by 20 cent pieces) and 2 undercover picnic tables. Nearby are public toilets. The Wudinna Tourist Information Bay is a pleasant place to stop and have a roadside lunch. Situated along the main Eyre Highway is the Caltex "Granite Country" Roadhouse which is open from 8-00 am to 7-00 pm Monday to Friday, and 9-00 am to 7-00 pm on weekends. Within the Roadhouse is a dining area and toilets are located outside. Also located on the main Eyre Highway is the Wudinna Mobil Roadhouse which is open between 6-30 am and 10-00 pm 7 days a week. The Mobil Roadhouse has EFTPOS facilities and accepts Mastercard and Diners Club Cards. Outside the Mobil Roadhouse is a Coke vending machine for after hours use. Located nearby is a public phone box. On the main highway is the Wudinna Laundromat. The Gawler Ranges Motel and Caravan Park is also located on the main Eyre Highway and is situated near the Caltex Roadhouse. This motel accepts Visa and Mastercard and accepts EFTPOS payments aswell. The Gawler Ranges Motel offers deluxe, standard and family units aswell as units for disabled people. Facilities available also include a licensed restaurant known as "The Sturts Restaurant", which is open daily for meals between 6.30pm and 8.00pm - excluding public holidays. The restaurant offers affordable home style meals. In addition the Motel also offers an indoor pool, heated spa and conference room. The Gawler Ranges Caravan Park is located nearby and also provides a deluxe cabin and 4 standard cabins offering self catering accommodation. Within the caravan Park are powered sites, tent sites, on site caravans, and a barbecue and laundry facilities. Pets are allowed. Office opening hours are 7 am to 10 pm Monday to Friday, and 8 am to 10 pm on Saturdays, Sundays. For and public holidays. For further information telephone (08) 8680 2090 or visit www.gawlerrangesmotel.com. The main shopping area for Wudinna is located behind the wheat silos. Located on Burton Terrace is the Wudinna Newsagency, a gift shop, the public phone, Wudinna Post Office and associated Commonwealth Bank Agency. Wudinna Hardware Store also offers a bus booking service for the Premier Stateliner Bus that travels between Adelaide, Streaky Bay and Ceduna several days a week. Bank SA also offers EFTPOS facilities and has an ATM machine, a useful service for both travellers and locals alike. 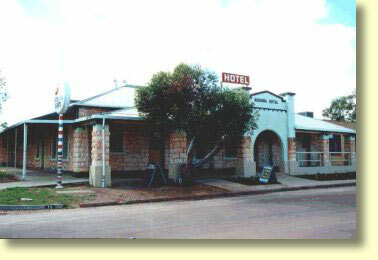 Wudinna Hotel is also located on Burton Terrace within the heart of Wudinna. Opening hours for the Hotel are 11-00 am to 12-00 am Monday to Friday. Opening hours for Saturdays are 10-00 am to 12-00 am and Sundays are 11-00 am to 8-00 pm. Counter lunches are served between 12-00 pm to 2-00 pm and 6-00 pm to 8-00 pm. For further information Wudinna Hotel can be contacted on (08) 8680 2019. Behind Burton Terrace is Ballantyne Street. Here you can find Wudinna's Foodland supermarket. Wudinna's Supermarket accepts EFTPOS transactions. The supermarket opening hours are 8-30 am to 6-00 pm on Monday, Tuesday and Thursday. Wednesday opening hours are 8-30 am to 7-00 pm, Friday 9-00 am to 11-30 am and Saturday 9-00 am to 11-30 am. Foodland is closed on Sundays. Nearby is the Wudinna Bakery. Here you can buy freshly baked bread, cakes, pies and pasties - and I might add they are pretty good too. Wudinna's Bakery hours are 9-00 am to 5-30 pm Monday to Friday, and 9-00 am to 11-30 am on Saturday. Opposite the Bakery are public conveniences. Also located on Ballantyne Street is Wudinna pharmacy where you can buy gifts and camera films. Within Wudinna is a 26 bed hospital that has the services of an on call Doctor. Once a week a Dentist practises surgery in Wudinna. For emergency Roadside services the RAA can be contacted on (08) 13 11 11. Wudinna is located within the heart of Granite Country. 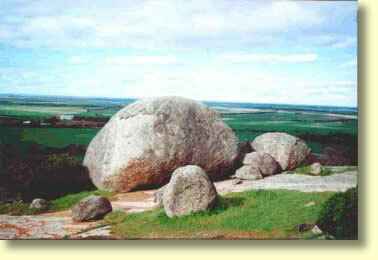 Around Wudinna are a number of interesting granite outcrops including Ucontitchie Hill, Mount Wudinna and Turtle Rock. Ucontitchie Hill is located 30 kilometres south of Wudinna and can be reached by travelling along a well maintained dirt road. After 30 kilometres you will need to pass through 3 farm gates before reaching the Hill which can be observed from the main road. When passing through these gates please leave them as you found them, that is to say, if the gates were closed then please close them. Ucontitchie is an inselberg of international geological significance and exhibits many fine examples of weathering structures. For the Nullarbor traveller perhaps the Mount Wudinna Recreation Reserve is more accessible. Mount Wudinna Recreation Reserve can be accessed by heading down "Route 63" which is a well maintained dirt road travelling past some significant local granite formations. Along Route 63 are roads that access Turtle Rock and the Mount Wudinna Recreation Area. Within the Mount Wudinna Recreation area the traveller will find an exceptionally well maintained Bush Picnic site. This Bush Picnic site has FREE Gas Barbecues, public toilets, a water tank and comfortable facilties. If you are travelling around Australia and want to leave the bitumen for a while Mount Wudinna Recreation Reserve is definitely worth a couple of hours or so. Throughout the Recreation Reserve are a number of short bush walking tracks. It's also an easy walk to ascend Mount Wudinna which is Australia's largest monolith after Uluru (Ayer's Rock). To be fair it is only 260 metres tall compared to Uluru's 335 metres however the views from the top are still quite magnificent. For the long distance traveller I would also recommend the Recreation Area as a pleasant place to have a picnic or rest break for an hour or 2 before continuing your journey. Mount Wudinna is where the locals go for a spot of recreation and might therefore appeal to those of you with children who need to stretch their legs. 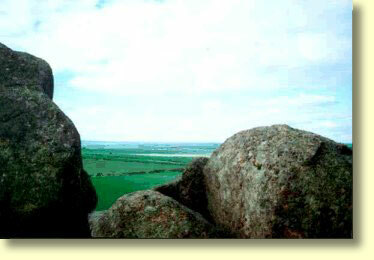 Wudinna is also located within an hour's drive of the Gawler Ranges. For advice on local attractions and road conditions in the Gawler Ranges it is recommended you visit the Wudinna District Council Offices in Burton Terrace. The Council Offices will update you on current road conditions and offer you information brochures of the area. Click here to visit the Wudinna District Council website for more information about Wudinna's local attractions. Le Hunte Council can also provide you with an information pack and advice if you email visitorinfo@lehunte.sa.gov.au. If you are travelling at night between Ceduna and Port Augusta there are no 24 hour fuel services. Accordingly plan your fuel stops in advance, particularly if your vehicle's fuel tank has a limited range.